AKVIS Chameleon - Collage Creation Software for automatic adjustment of inserted objects to the target image color range. The tool is extremely easy to use as it does not require precise selection of objects. AKVIS Chameleon - Collage Creation Software for automatic adjustment of inserted objects to the target image color range. The tool is extremely easy to use as it does not require precise selection of objects. Copy an object, insert it into another picture, press a button and the object adjusts to the new background as chameleons do - adapting to the new color range and blending with the environment. 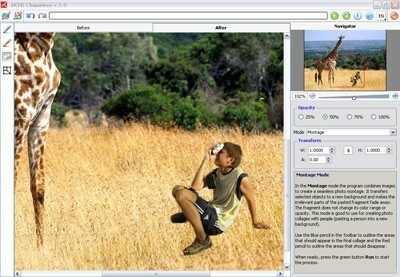 AKVIS Chameleon is used to insert new objects in a picture, but with much more flexibility and ease than with conventional tools (collage creation). AKVIS Chameleon is also used to conceal undesirable artifacts by replacing them with the nearby parts of the image (similar to the clone tool). AKVIS Chameleon creates photo collages in two modes, Standard and Snapshot. In Standard mode, one click automatically drops a selected item into a photo, adjusts it to the target color range and smooths the borders. The Snapshot mode layers the blended components so that the texture and relief of the primary image can be seen through. The official web-site (http://akvis.com) offers numerous examples and ideas on using the Chameleon Plugin application. AKVIS Chameleon plugin is compatible with Adobe Photoshop, Photoshop Elements, Paint Shop Pro, Photo-Paint and other image editing software. Refer to the Compatibility page for more details: http://akvis.com/en/compatibility-software.php The software works under Windows 98, Me, 2000, XP, NT and Mac OS X.